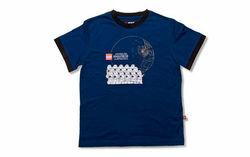 852763 LEGO Star Wars Stormtrooper T-shirt is a Star Wars T-shirt released in 2009. It comes in various sizes. This is a description taken from LEGO.com. Please do not modify it. The Empire is on the march'¦and on this shirt! A legion of Imperial Stormtroopers defends the Death Star on this fun and striking blue LEGO Star Wars T-shirt with black trim. Available in Youth sizes YS (Small), YM (Medium), YL (Large) and Adult sizes S, M, L, XL and XXL. 100% cotton. Facts about "852763 LEGO Star Wars Stormtrooper T-shirt"
The Empire is on the march'¦and on this shirt! A legion of Imperial Stormtroopers defends the Death Star on this fun and striking blue LEGO Star Wars T-shirt with black trim. Available in Youth sizes YS (Small), YM (Medium), YL (Large) and Adult sizes S, M, L, XL and XXL. 100% cotton.